Instead the user is prompted to go to the unity (ubuntu) bug page & manually open a new report. This is obviously not as useful as no info about reporting machine or env is added. I was unable to recreate this using the Ubuntu version of unity on Xenial. Are you perhaps running unity from an upstream PPA? 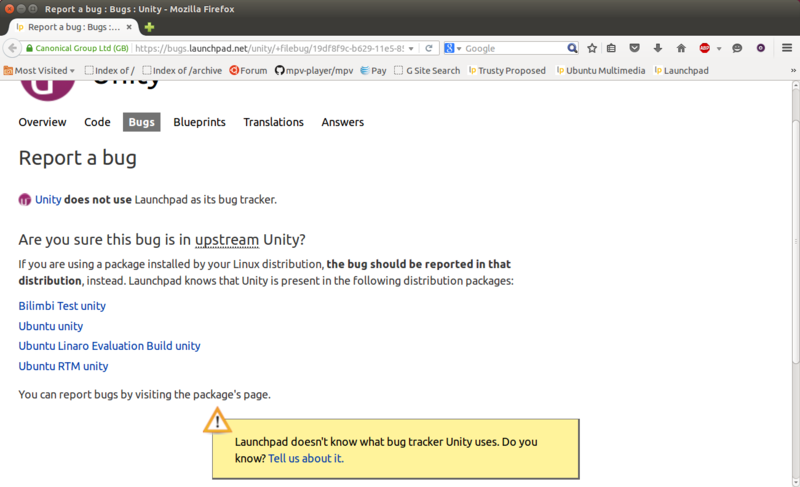 As each source package can install it's own apport hook its possible the hook is filing the bug about the unity project, which doesn't use LP as a bugtracker, and not about the Ubuntu unity package. Sorry Brian, meant to check back & mark invalid as the issue seemed to resolve itself with a new install several days later. (- no, it was a straightup install from a daily image, no ppa's of any sort..